Feeling Short of breath: If you suddenly feel exhausted and out of breath after doing a seemingly simple chore or taking a flight of stairs, you should start by exercising more caution. It is easy to brush off this symptom aside taking it just as a day to day fatigue, but the underlying problem may be more diabolical than we think. This is a striking sign of heart disease that must be reported and is commonly seen in women. Circular breathing may help the patient catch his breath for a moment but is not a replacement for proper medical treatment. Dizziness: Dizziness is a feeling of being lightheaded. While dizziness could be due to many factors, it should mainly be taken notice of if it is of sudden onset. Loss of balance and coordination resulting in having trouble walking are all signs of a stroke which demands prompt action. 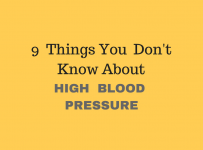 This can be caused by an underlying high blood pressure disease. When your blood pressure remains high, your risk of stroke increases, which may put you at risk of sustaining injuries from falls or other accidents. Blood pressure can be kept normal by regularly attending appointments with your concerned Doctor. Facial Flushing: Although facial flushing can be caused due to many triggers such as; exercise, emotional stress, extremes of weather, alcohol consumption, spicy foods, hot drinks, wind, sun exposure, etc, it should not be ignored if it frequently occurs or due to a slight excursion. It is thought to have occurred due to dilated arteries and due to your blood pressure being higher than usual. Facial flushing can also occur due to exposure to heat or hot water, exercise, alcohol consumption and emotional stress – all of which can raise your blood pressure level temporarily. Blood spots in the eye: This symptom can be quite dangerous. Having blood spots in the eye may be due to an underlying glucose derangement (Diabetes) or a sustained high blood pressure. If these blood spots remain untreated, they can cause permanent damage to the optic nerve and cause blindness. This warrants an annual checkup to the ophthalmologist along with a blood pressure check. Headaches and nosebleeds: High blood pressure within a certain limit does not cause severe problems and nosebleeds, but when it gets out of an acceptable range it may very well be the cause of bursting arteries in the nose and headaches. This is known as a hypertensive crisis and is a medical emergency. Blood pressure readings at this stage may be 180/120 mmHg or even higher. Abnormal heartbeat: During a high blood pressure, the heart’s fine-tuned calcium control system becomes unstable which result in irregular heartbeats. This is the reason high blood pressure can increase arrhythmias. Blood in the urine: People with high blood pressure could experience blood in their urine. According to research by WebMD, discovering blood in your urine could be a sign that your blood pressure is out of the normal range. However, blood in the urine can also be a sign of a kidney stone. The best way is to go to a doctor and get your blood pressure checked. If you encounter any of these symptoms, see a doctor immediately. Untreated blood pressure can lead to kidney failure, heart disease, stroke, and eye problems. That is why blood pressure is also known as the ‘silent killer’.However, blood pressure can be naturally prevented by exercise, eating a nutritious low-fat diet, decreasing sodium intake, maintaining a healthy weight and taking your blood pressure medications are directed by the Doctor.